Update 4/23/15: You’ll find the replay, plus full show notes at the end of the post. If you rely heavily on Pinterest and run ads on your site, then you’ll definitely want to join in on this webinar. I’ve invited several special guest panelists who run niche sites and design them to share their plugins list and why they like particular ones. We’ll also cover ad networks and how they impact your site performance. Plus, we’ll discuss the big changes happening with mobile sites and search, and how both impact your ad revenue. And, we’ll show you a new mobile app made specifically to showcase niche sites. And, you’ll have the chance to put your two cents in about what plugins you like and why too. Together we’ll make a list of all the top plugins and then I’ll run head-to-head and performance and function tests on them to see which ones really are the best. That’s why this is a reverse webinar. You tell me what you want to know more about, and then I’ll run the tests and report the findings. 20 years ago with a young family and a house that needed work, Ann found ways to find the look she saw in magazines on her own and on a budget. That house has become the focus of her full time job, On Sutton Place. She features decor, recipes, gardening, sewing and easy DIY projects. Ann and her husband live in Ohio with their little dog, Kelly. My Soulful Home is a community of kindred spirits where you can be inspired, learn a bit and have a laugh or two. Putting heart, mind & soul into all I do & sharing with you on my blog and now on bHome, my new home & garden app. www.bHome.us Visit me & all the other top notch bloggers & shelter magazines there! Since 1998, Cyndi has been creating custom sites and business support that is tailored to each client’s needs. This is a zero-pitch webinar. Just straight up help for you and your site. And it’s free! We’ll run at least an hour and there will be a replay. But, to get your comments and questions addressed, you have to be there live. There are a few seconds of silence at the beginning. 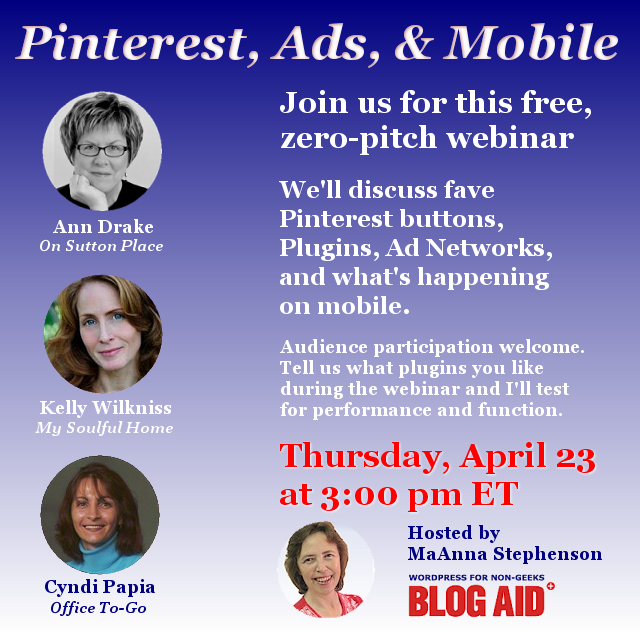 2:45 Ann Drake of On Sutton Place – discussing Pinterest, recipe plugin, Pinterest plugin and why she likes these. Pinterest Pin It Button Pro – works on every image and mobile. The Pro version has lots of settings, like removing Pin It button from some images. The Lite, free version, has less options. 11:45 Responsinator – for mobile emulator, but does not pick up specific mobile themes, like the one from AdThrive. Also, it shows the Dreamgrow Scroll Trigger Box but it doesn’t actually show up on a real phone. 14:15 Ann talks about AdThrive and why their mobile theme is so important. 16:15 MaAnna explains the difference in mobile-friendly, mobile-optimized, and fully responsive themes. And why customizing the fully responsive is so important to not lose revenue. 17:00 Testing a custom mobile theme and how it could fail Google’s Mobile Friendly tester. You can’t fix that in your theme code, or your regular site’s robots.txt. 20:00 Andy Marzka (of AdThrive) commented that you can see a proper mobile rendering with the Chrome extension for Developer Tools. Will likely be changing over to the same one that Ann is using. 30:45 bHome – her app for Home and Garden Community. 38:45 WPTouch does not work well with WordPress SEO by Yoast plugin well. 41:00 Cyndi talks about additional design elements for mobile. 43:30 Chrome dropping support for Java, and ads not working. 47:00 Cyndi discusses image optimization and sizes she sees that are way too big and why. 50:00 Ann talks about Adobe Lightroom 5 for optimizing. 52:50 Cyndi starts discussion if images in post can be changed and not affect images that have already been pinned on Pinterest. There was a lot of community discussion in the chat on this too, and since then others have tested and confirmed that you can change the image, or even delete it. Images that have been pinned reside on Pinterest and still link back to the post. Thanks to +Tammy Doiel and +Melissa Will for all the tests on that. 60:00 Andy Marzka, creator of AdThrive, joins the chat to discuss the new mobile theme plugin for their clients. He also covers the big changes in ad buyers at this time, like the blinky ads, and videos that auto play. He also discussed his conversations with Google and how they are blocking bad ads. 72:00 MaAnna wraps up with final suggestions for properly vetting information about what works best.